BigIron co-founders, Ron and Mark, continually speak of their foundation of their youth on the farm and of the leadership that was instilled in them as FFA members. They have first hand experience of the success that can be reaped from youth-based, leadership-building associations. BigIron believes in giving back to the organization that had impacted its founders and in turn, investing in the future of Agriculture. For a second year, BigIron Auctions, in partnership with National Farm Machinery Show, is conducting a special auction benefiting the Kentucky FFA Foundation – The Blue & Gold Auction. This year, the two-part auction is open to everyone interested. Whether you are an exhibitor or attendee at NFMS, or an individual interested in supporting the endeavors of the FFA Foundation or perhaps wanting to purchase a new Mahindra UTV or Gatormade gooseneck trailer, everyone can take part. The first component of the Blue & Gold auction is an online silent auction held during the days of the National Farm Machinery Show on an online platform outside of BigIron.com. On the silent auction you can bid on items such as Turkey Hunt experiences from North Fork Outfitters, tires from Titan Tire, Power Modules from Steinbauer, and more. Or you can text KentuckyFFA to 24700 to start bidding on the silent auction. The second component of the auction takes place on BigIron.com’s regularly scheduled weekly auction to conclude on the Wednesday, February 21st (the Wednesday after the National Farm Machinery Show). Registered bidders have the opportunity to bid on and purchase a 2018 Mahindra UTV, 2018 Massey Ferguson Compact Utility Tractor, 2018 Gatormade TA Gooseneck Flatbed Trailer, Danuser T3 Post Drivers, and more. 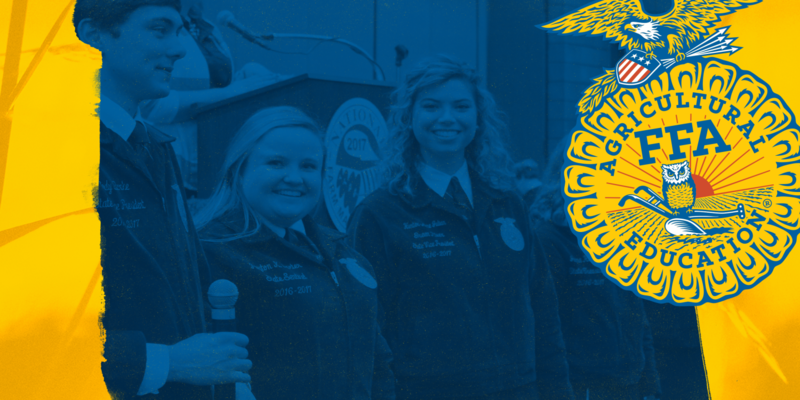 Everyone sponsoring this special event, including everyone at BigIron Auctions and the National Farm Machinery Show, is enthusiastic for for this year’s Blue & Gold Auction and eager to see how much support can be rallied for the Kentucky FFA Foundation! Thank you to everyone donating and participating this year! For over 50 years, the National Farm Machinery Show has annually attracted thousand of agricultural professionals and farmers to see “the most complete selection of cutting-edge agricultural products, equipment and services available in the farming industry.” Business professionals from around the world gain knowledge and hands-on access to various technological advancements needed for the upcoming farming season during the four-day show. For more information, visit www.farmmachineryshow.org. The Kentucky FFA Foundation raises support to accomplish the vision of FFA, “Growing Leaders, Building Communities, Supporting Agriculture”. There are 160 FFA Chapters in Kentucky and 14,690 FFA Members. This year, funds raised will support our State FFA Convention, June 4-6 at Rupp Arena in Lexington. It’s a high level leadership experience, attended by over 2,000 FFA members who will be competing in Career Development Events, taking part in leadership training and celebrating their hard work and accomplishments! We have a registration fee of $35/student and it covers concerts, speakers, meals, a Career Expo, and so much more! We are able to provide this one of a kind experience because of generous sponsors.